In honor of Hispanic Heritage month, the Louise and Bernard Palitz Gallery at Syracuse University’s Lubin House is presenting “Emilio Sanchez: No Way Home. Images of the Caribbean and New York City.” The exhibition contains 19 objects and examines the artist’s long interest in depicting the effects natural light has on residential and urban architecture. “Emilio Sanchez: No Way Home” will run from Oct. 15-Dec. 6. Located at 11 East 61st Street between Fifth and Madison Avenues, gallery hours are 10 a.m.-6.p.m. Monday to Friday and Saturday 11 a.m.-4 p.m. The gallery will be closed Thanksgiving weekend. “Emilio Sanchez made images of New York that combined an abiding interest in architecture with a signature use of pattern, composition and brilliant lighting gained from a lifetime spent in Cuba and the Caribbean,” says David L. Prince, associate director and curator of collections of the SUArt Galleries, who also notes that Sanchez’s urban architectural images reflect those of Charles Sheeler and Edward Hopper. Born into one of Cuba’s oldest and wealthiest families, Sanchez was educated in America at the Choate School, Yale and University of Virginia. In 1944, he moved to New York City to attend art classes at Columbia University and at the Art Students League. He became a naturalized citizen of the United States in 1968. 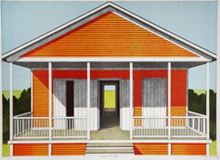 In the 1960s, Sanchez developed a technique of focusing on a detail; he combined a bright palette, sharp, deep shadows and a shallow picture plane to design compositions and Caribbean architecture. In the 1970s, he was inspired by the Mediterranean, particularly the stark white buildings of Morocco. In the ’80s and ’90s, Sanchez increasingly composed scenes of New York City. “Emilio Sanchez: No Way Home” is free and open to the public. Visit lubinhouse.syr.edu/palitzgallery/current.html to learn more about this exhibit. You can also call 212-826-0320 or e-mail lubin@syr.edu for more information.